When it comes to selecting color schemes not everyone goes for soft, coordinating colors. Some brave souls take the road less traveled and go for bold contrast. Luckily for those with a flair for fright, Halloween is all about the drama! Orange and black are the traditional colors associated with Halloween, probably due to a variety of things such as darkness, death, and the general orange-y colors of the harvest. 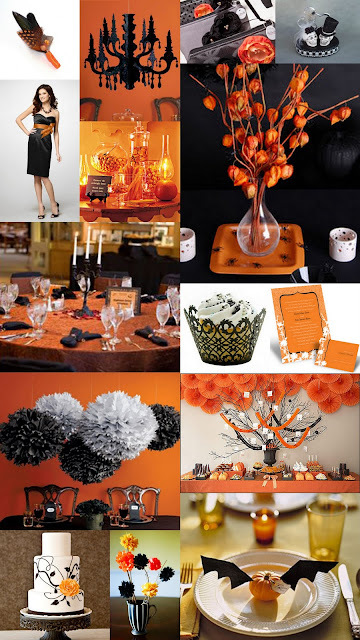 Orange and black can be a fun pairing to really get you in the "spirit" of fall, but it can also be elegant and warm depending on the shades of orange you go with. A vibrant orange will give you that youthful, spooktacular, kind of feel while a butternut squash or pumpkin hue will create a space that feels more cozy and sophisticated. Images from: a variety of wonderful sources that were lost when Jen's computer crashed. We are working to recover them and will credit accordingly.